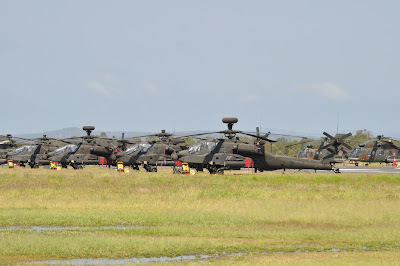 Intrepid Australian plane spotters have uploaded yet more images of the Singapore Armed Forces (SAF) Exercise Wallaby detachment on the Central Queensland Plane Spotting site. Please click here for more. 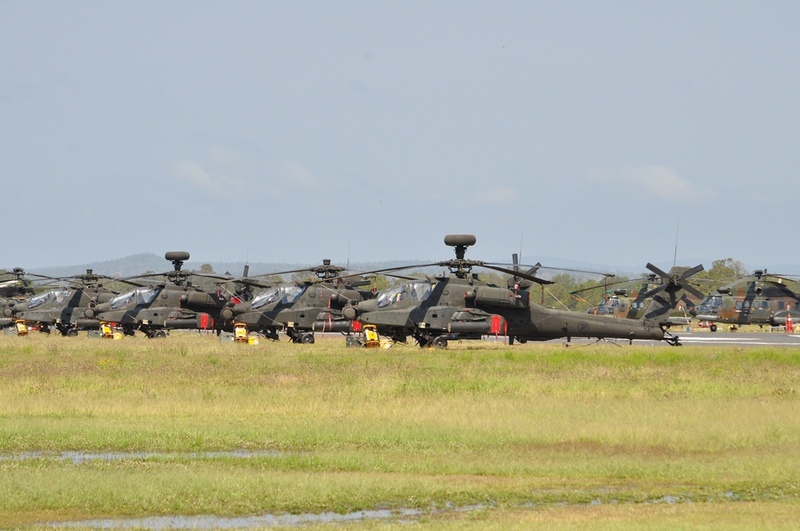 Pictured above are four Apache AH-64D attack helicopters from 120 Squadron at Rockhampton Airport in Queensland. Two AHs have the Longbow search/target designation radar with another pair without, which is no handicap for the AHs without radar as the data stream can be shared among the Apaches. Tail numbers as follows: 063, 065, 066, 067. 3. Photo opportunity of DM's interactions with SAF servicemen and reflections after viewing the live-fire phase. While much is made of networked operations between AH-64s, this mode of operations has many implications. It means the helicopters must operate at least in pairs because the radar enables engagement of targets and movement from crest to crest with a minimum of risk. Meaning to say the non-Longbow equipped helicopter is disadvantaged when the equipped helicopter returns to rearm, else it must return as well. Tying the aircraft into groups reduces effective availability across time and space. It concentrates more firepower than experience shows is likely to be needed in a given location. It also results in disporportionate use of equipped aircraft on missions requiring only single aircraft. Furthermore it results in exposure of two aircraft during the attack.